This post is aimed directly at creating a CV for a designer. If you are not a designer, this post maybe is not for you. The point of a CV is to get all your personal information across, while also incorporating you skill, work experience and personality. Graphic designers and artists have an edge over other job seekers since we can make our CV’s visually pleasing and more like an info graphic rather than dull and just text based. I think it’s actually expected from us, since the design we use also reflects our skill as a designer. First of… what does a good CV need? In this day and age employers don’t really want to read essays about your life so it’s best to keep everything short and to the point. That’s why a graphical approach is a nice way to say a lot with very little. Remember, a CV needs to get you the interview and the interview then gets you the job. So don’t overexaggerate the CV with too much information. What you also need to consider is that your CV needs a neat and tidy layout so everything is clear and visible at first glance. The worst thing you can do is clutter up everything so the potential employer can’t find the information he/she needs. Also, if the graphics look good but don’t really convey what they are supposed to represent, they’re pointless.Also keep in mind that a lot of the more creativ CV designs use some sort of messuring format for skills. That’s a bad idea if you ask me. Your 100% may not be the same 100% the potencial employer is looking for. My advice is to omit any type of skill grading. If an employer wishes to know how skilled you are at something he will call you in for an interview and ask. Use standard sans-serif fonts and avoid using italic fonts if possible. There’s nothing wrong with using non-standard fonts, we are designers after all, but be careful to use a font that’s readable at first glance. Avoid filler words and information. There’s nothing employers hate more than words like “synergy” or “go-getter” because they make you sound pretentious. The format you use is dependent on how you want to use the CV. It’s vital to have at least one printable version but if you want use you CV on a website it can take all sorts of forms. I’ve even seen online CVs that utilize flash animation. Just keep in mind that no employer is going to go searching for your CV on the internet so a printable version is mandatory and any other form is just icing on the cake. Some articles online suggest you omit your interests and hobbies. I tend to disagree, especially if you are applying for a job in a creative environment. If you state your hobbies and interests it reflects your personality (also creative personality). People like to employ job seekers they have something in common with if possible because that makes for a better working environment. Just don’t go overboard with it. There isn’t really much more I can say here except to show off some good CV ideas to maybe inspire you. Just as an example. 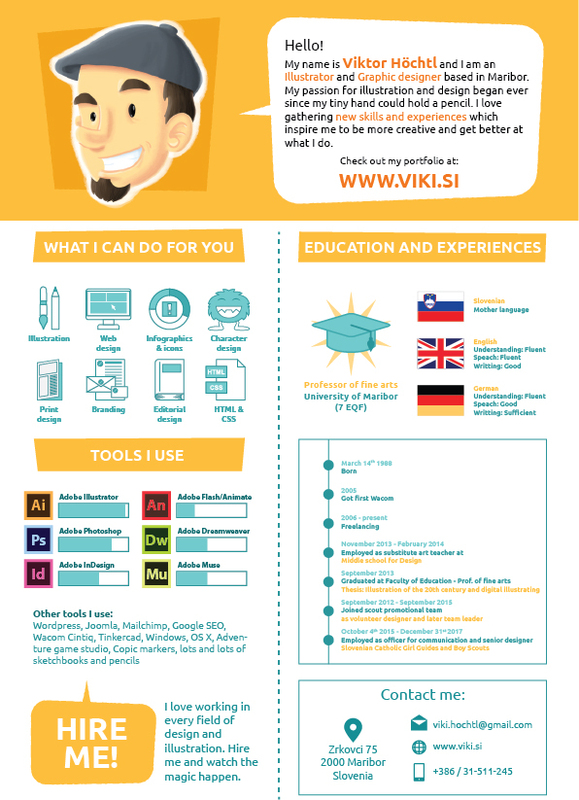 Here is my CV :).